To both residents and visitors, Edinburgh offers a cultural feast with an enchanting blend of heritage, history and Scottish hospitality. 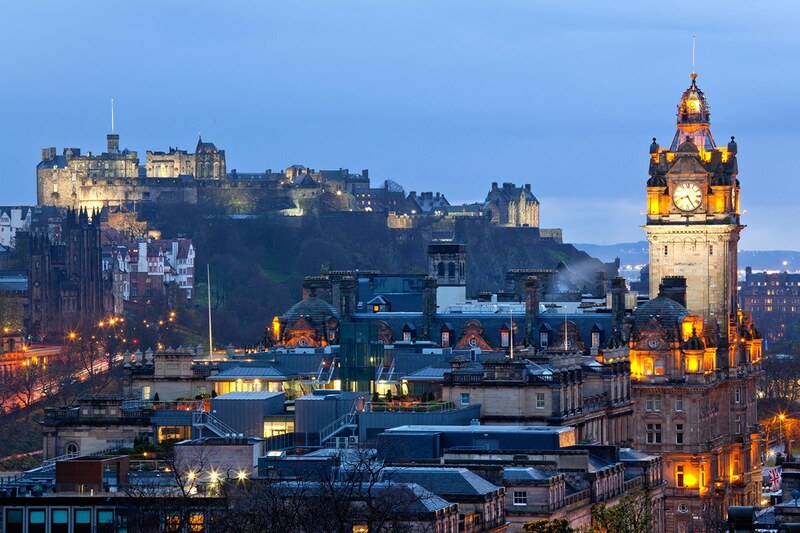 Food and drink is a source of pride in Edinburgh for good reason – there are restaurants in the city to satisfy any taste and budget. From street food on the go to Michelin-starred dining, it is possible to tour the world with food as you walk through Edinburgh’s cobbled streets. Food is a talking point in its own right in this city – haggis, salmon, beef, the infamous deep fried Mars Bars or tikka masala, the choice is eclectic! There are so many restaurants that you might not know which way to turn, so we’re sharing some of our favourite Edinburgh eateries for you to explore. If you want to impress a date, The Witchery offers a gloriously gothic, opulent and slightly eccentric dining experience. The interior design is part of the experience – exuberantly decorative with extravagant velvet drapes, rich tapestries, classical statues and rococo cherubs. There is also an enchanting vine-wrapped Secret Garden hidden down a stone staircase and opening onto a hidden courtyard for magical al fresco dining. The food here is a mixture of French and Scottish luxury with shellfish bisque and steak tartare alongside Scottish langoustine or lobster, Scotch beef and Arran beets. The Witchery is located on the Royal Mile, moments from the castle entrance. There is no parking, but you can park at the luxurious sister hotel Prestonfields House and they will order and pay for return taxi transfers for you. Roseleaf is a friendly and quirky little cafe by day and a bar by night, bursting with fun and warmth. The interior is an eclectic mix of art on display, preloved furniture and treasures. Roseleaf really do seem to have thought of everything with everyone welcomed through the doors. By day you can enjoy choosing from a large array of brunch options or indulge in a ‘Mad Hatters’ T-Party’ – high tea with a twist! If you have a passion for brunch but you aren’t an early riser, you will be pleased to know that brunch is served until 5pm. By night try cocktails served by teapot, cheekily named ‘Pot-Tails’! With a large group with a variety of different tastes it can be difficult to please everyone. Debating on which food to choose, especially when Edinburgh offers such a large selection, can be frustrating as you will always end up with someone in the group who has to compromise. Located in the Omni Centre, COSMO Edinburgh caters for everyone whether you are having a pre-theatre meal, you are on a date or you are out with friends and family. With a selection of over 150 dishes on the world buffet menu, choose from Chinese and Japanese buffet dishes, Thai curries, Italian wood-fired pizza or a classic carvery for fans of a roast dinner. You can also enjoy the theatre of the live cooking stations while you eat, watching the skill of the teppanyaki chefs as they prepare your choice of food in front of you. The selection of desserts will also cater for everyone in your party from healthy fresh fruit to a cascading chocolate fountain and pick and mix sweets for those who want to treat themselves. A winner of ‘Best Restaurant Bar in the World’ you won’t find bowls of nuts, pork scratchings and crisps here. The Bon Vivant takes the food as seriously as it does the drinks. The menu changes on a daily basis and offers tapas style dining. Dishes that are on offer start at just £2 and might include mouth-watering options like smoked brisket hushpuppy, horseradish or mushroom, truffle and feta sausage roll, alongside mains such as Duo of Lamb, tabbouleh, feta, rose harissa, pomegranate or aubergine parmigiana, asparagus puree, crème fraiche fried basil – a true range of flavours! The dessert menu is just as varied with buttermilk panna cotta, rhubarb, shortbread or raspberry, elderflower and almond Eton mess. Urban legend has it that Scotland was the birthplace of the nation’s favourite dish, from the premises of a restaurant in Glasgow. MP Mohammad Sarwar has argued in the past that Glasgow should even be awarded EU protected geographical status for the tikka masala. Sadly, this notion hasn’t been taken forward, but there is no doubt that Scotland’s love of Indian food has led to some world-class Indian restaurants. Head to Navadhanya in the Haymarket area of Edinburgh for a luxurious Indian fine dining experience where the food is prepared by Michelin trained chefs. This restaurant combines the best of British ingredients with Indian heritage for a a twist on the favourite dishes and a different Indian dining experience than the usual Indian restaurant. For a more family-friendly Indian dining experience, COSMO’s Indian selection caters for all tastes, ages and budgets. The Tower Restaurant is located between the rooftops of Edinburgh’s Old Town. The view is the first reason why people choose this restaurant with stunning views of Edinburgh Castle. Floor to ceiling windows allow you to dine while taking in the spectacular views from the rooftop. The restaurant is sleek and stylish with no fuss, simply white tablecloths and soft lighting to create a minimalist environment where the view takes centre stage. The menu is premium, but then you are paying for the view. The food continues the traditional theme with Scotch beef, game or some fantastic vegetarian options. There are no surprises on the menu – just luxurious, high quality favourites. Veganism is on the rise and Edinburgh caters for vegans wholeheartedly, with events such as the Scottish Vegan Festival. Henderson’s is a meat-free zone with colourful and innovative salads as a speciality. Since opening in the 1960s Henderson’s has gone from strength to strength, now with a vegan bistro along with their vegetarian shop. You can choose from dishes like the vegan haggis and root mash or the mouthwatering grilled goat cheese with caramelised beetroot served with watercress and garlic chives – which looks like a work of art. If you love the food served in the bistro, you can buy a Henderson’s cookbook from the shop on the way out to recreate the dishes at home. You can’t talk about food in Edinburgh without mentioning haggis! If you don’t fancy the look of a traditional haggis, head to the Whiski Rooms where you can try haggis spring rolls with plum sauce and vegetarians can try the veggie haggis. The menu also offers hearty food such as steaks and pies and traditional sponge puddings which you will need to line your stomach if trying the whisky on offer! The restaurant more than lives up to its name – there are more than 300 whiskies which staff will help you to pair with your meal.